Best-selling Children’s book author Nancy Carlson decided to become an artist in Kindergarten. She has drawn ever since. She has illustrated many wonderful books along with writing many. Nancy is a Minnesota author who has written 44 books that are found in libraries and bookstores around the world. Nancy Carlson’s books encourage and instruct. Each of her books has a message or theme that helps kids look at the world around them in a new way. She has books on differences between people and feeling good about yourself just the way you are. She has written several books that help kids cope with difficult situations. The way to get really good at something is to do it over and over and Nancy said that she sat on her bed and drew and drew ever since she was five years old. Her art is inspired by the comic books that she loved. Nancy recommends many books, and a couple of her favorites are The Color Purple by Alice Walker, Call of the Wild, By Jack London, Betsy Tacy and Tib by Maud Hart Lovelace. This Minnesota author lives in Bloomington with her Husband and she has three children who are creative and wonderful people. I enjoyed meeting Nancy Carlson at a Barnes & Nobel Book signing event. We were both there promoting our books on a lovely Saturday. I did my motivational reading program and she read from her most recent book. The crowd loved the event and I had so much fun with this wonderful woman. She even said how much she enjoyed my comedy magic and wrote a nice comment about the magic . Besbestt selling Children’s book authors at a Barnes & Noble book signing. Nancy Carlson is a Minnesota Author with books in libraries across the world. Tomorrow, May 18th. 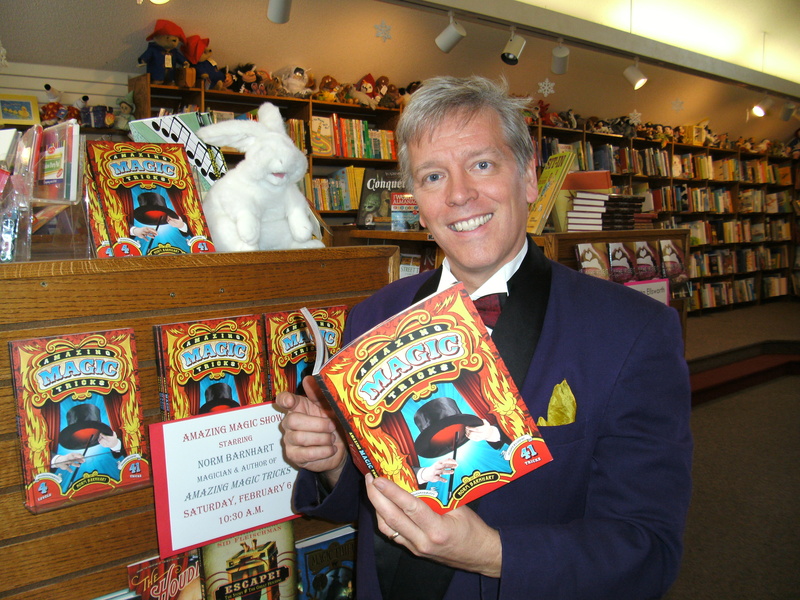 is book signing and showtime in Wisconsin for Minnesota Author and comic magician, Magic Norm. I will present my comedy magic show for the families at the library. this will be my 6th time here over the past 25 years. I am grateful that they invite me back and am thrilled that they like the program. This magic and comedy show motivate youngsters to get excited about reading. Many topics are covered such how reading helps with hobbies, interests and jobs. Kids and parents leave the show with a greater appreciation for how reading helps in everyday life and is just plain fun. If we can get students excited about reading, they will do well and achieve in all the subjects they work on in school. The goal of the library show is to encourage students to read all summer and to visit the library as often as possible. Earlier today, I spoke and presented my reading program at a school in Rochester, MN. I enjoy presenting my motivational magic show and encouraging the students. Today was my 7th or 8th time at this school over the past 25 years. I am glad that they appreciate the quality and enjoy the important message. I was the original reading motivational magic show in Minnesota. I put together this program and developed the magic tricks to go with it over 30 years ago. Since then it has gone through many changes as I add new material. I now have three different motivational magic shows for kids. Since then I have enjoyed bringing the show to students and teachers at schools and libraries in all fifty states. I love to see the smiles and amazement that the comedy magic brings, but I also very much enjoy seeing students get excited about reading. I had a blast entertaining and then doing a book signing at the Red Balloon Bookstore last weekend. Several friends who are entertainers showed up and that was great to see them again.The families were great and I enjoyed meeting so many nice people. I was excited to see the reception my books have had and it is fun to be a Minnesota Author. One gentleman who works for 3M brought his son and it was fun to see the smile on his face when his son became the star of the show and did a few tricks with me. I try to involved the whole audience and make each kid feel like they are helping to make the magic happen. A favorite is one of my original tricks where snowflakes are magically pull from the children’s ears and then they start tossing them into the pan and an audible “plink” is heard as they toss their invisible snowflakes in. A moment later, the flakes assemble and a magical snowman appears! It is fun to see their reaction of amazement. The Red Balloon Bookstore recently wrote and said that they received wonderful feedback and that the staff is still raving about the event. They are looking forward to a return engagement. I love to bring comedy and magic to store promotions. My magical entertainment has appeared at many malls and shopping centers over the years. Last year a Target store invited me to do their annual celebration. Kids and adults enjoy fun magic and comedy. More information at MagicNorm.com. This Saturday February 5th is an opportunity for the public to see a free magic show and after get a chance to have their Amazing Magic Book autographed. I will be at the Red Balloon Bookstore in St. Paul, MN doing a Minnesota author Book Signing. The store will have plenty of books and you can get one for your child or friend. The books are doing quite well and are now in libraries across the U.S. If you cannot make it to the signing please check out how to get them on line at Amazon.com or my books page. Come, bring the family and enjoy the Amazing Comedy Magic Show at 10:30. After the show I will teach a few tricks out of the books and then be there for the autograph time.